You can download it for free at WordPress.org and try it on your website. Clean code and WordPress best practices make it lean, fast and secure. It’s retina ready and responsive so it will look great on any screen size using any resolution. Pho theme options can be set in Theme Customizer screen Appearance > Customize. This way you can preview all the changes you make before saving them. The typography settings are also located in Theme Customizer and you can choose your headings and body fonts independently. If you don’t add any widgets to the Primary widget area, then the full-width layout will be enabled. Pho theme uses standardized Theme Alliance Hooks, which make it very flexible. The hooks allow you to customize Pho or easily alter its functionality. If you’re a user who doesn’t want to dig her or his way through the code and still be able to create child themes, you can. A plugin called THA Hooks Interface allows you to customize Pho from within dashboard by hooking into Theme Hook Alliance hooks. 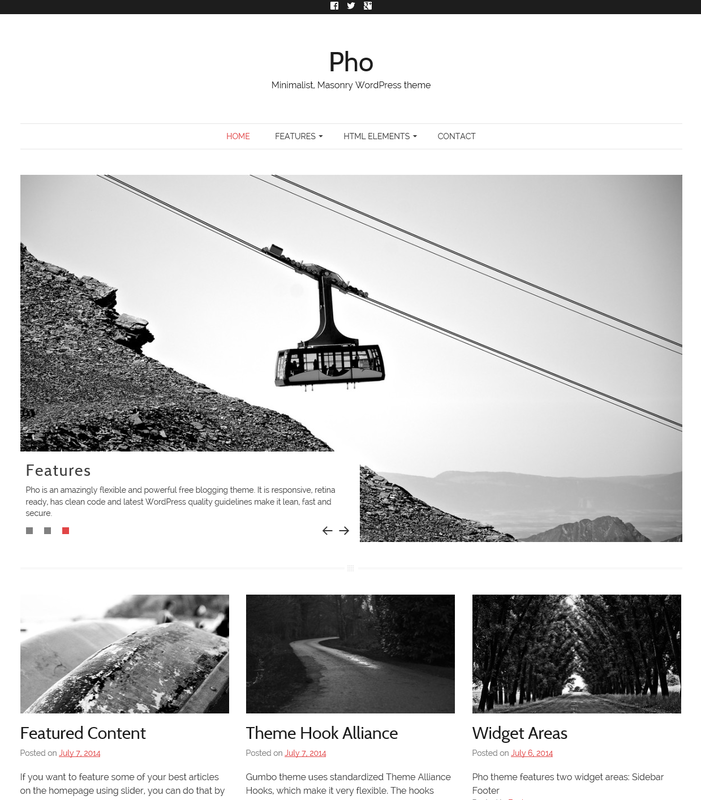 Pho WordPress theme is an excellent choice for anyone who’s looking for a fast and secure blogging solution with Masonry layout. For those who don’t like this Pinterest-like template, there’s also a Standard layout where articles are stacked on top of each other. Try Pho and tell us what you think of it or showcase your website in the comments below. I really like the Pho theme and love the way that masonry looks on my front page with the images, but is there a way to remove the featured image from the actual post? It becomes redundant there. If you cannot find the option to achieve this in the customizer, then no, there’s no option for removing featured images ini Masonry layout. How to add same slider on the home page. I am not able to find any way to add the slider that displays in the theme. For any future support requests, would you be so kind to use the dedicated Support Forums. I already added featured content to my website. I configured my front page to display latest posts. I am not able to understand how to create blogroll page. Blogroll is a page with latest posts on it. If you configured your home page to display latest posts, then that’s your blogroll. 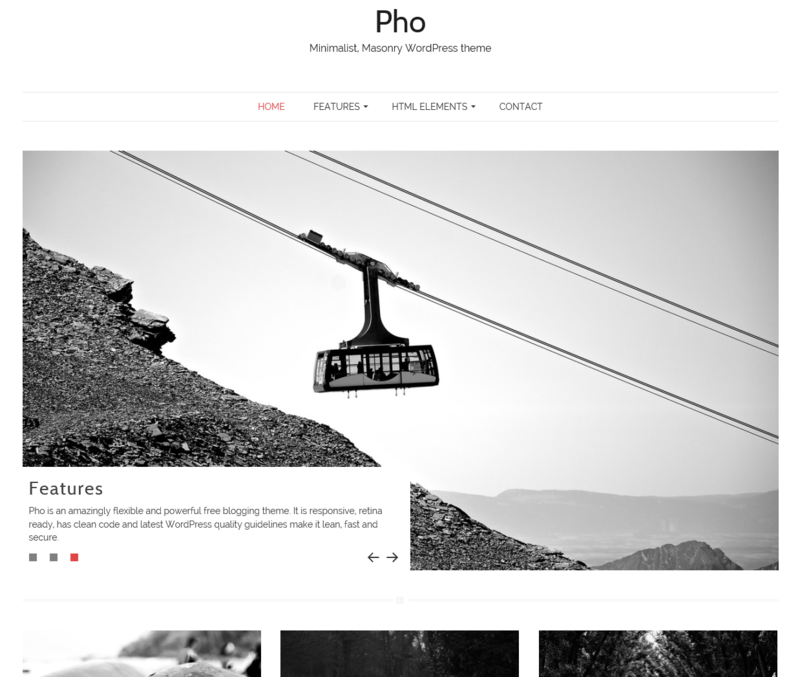 I really like your theme Pho. I have one question, when using the Masonry layout for blog posts what is the optimum size for featured images? To answer your question, the optimum width for featured images is 1170px. The height is flexible.